Researchers from the University of Geneva (UNIGE) and multi-institutional collaborators have been studying BACOVO—a one-dimensional quantum material. They report that the material exhibits a novel topological phase transition governed by two types of topological excitation. In addition, they were able to choose which of the two types would dominate the other. Their research is published in the journal Nature Physics. The researchers drew on the work of the 2016 Nobel Prize-winners for physics, David Thouless, Duncan Haldane and Michael Kosterlitz. The three physicists predicted that a set of topological excitations in a quantum material is likely to induce a phase transition. Numerous theories have been developed about these topological excitations, including the feasibility of combining two of them in a single material. But is that a real possibility? And if so, what would happen? The teams from UNIGE and CEA, CNRS and UGA were able to provide the first experimental confirmation of the theory predicting the existence of two simultaneous sets of topological excitations and the competition between them. The findings constitute a small revolution in the mysterious world of quantum properties. 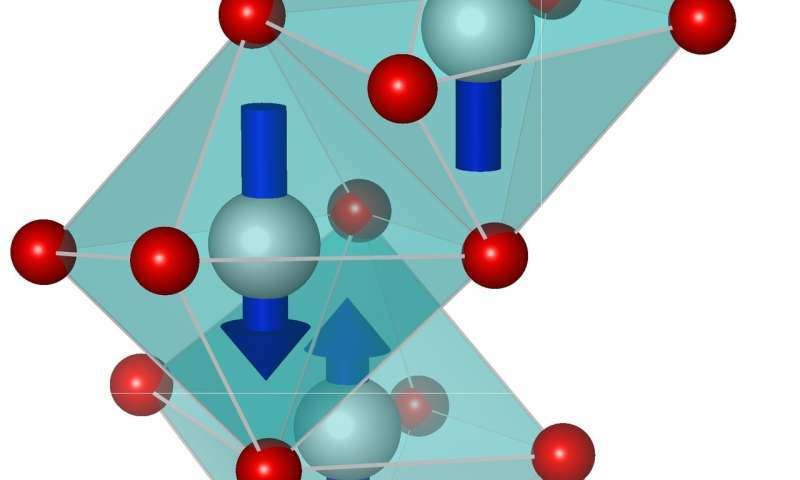 The researchers from CEA, CNRS, and Université Grenoble Alpes were working on a one-dimensional antiferromagnetic material with particular properties: BACOVO (BaCo2V2O8). "We performed various experiments on BACOVO, an oxide characterised by its helical structure," the researchers wrote. But the experimental results evidenced a puzzling phase transition—which is why the team called on Thierry Giamarchi, a professor in the Department of Quantum Matter Physics in UNIGE's Faculty of Science. Giamarchi says, "Based on their results, we established theoretical frameworks capable of interpreting them. These theoretical models were then tested again using new experiments so they could be validated." The aim was to understand how BACOVO's quantum properties act, especially their topological excitations. Quentin Faure, PhD student at the Institute for Nanoscience and Cryogenics (CEA/UGA) and Néel Institute, says, "For this purpose, we used neutron scattering, meaning we sent a neutron beam onto the material. The neutrons behave like small magnets that interact with those of BACOVO, according to a strategy characterized as 'disturb in order to reveal," helping us to understand their properties." When the model developed at UNIGE matches the experiment, it becomes the material's standard model. Professor Giamarchi says, "The model we established with Shintaro Takayoshi predicted exactly the outcome seen in the experiment." But this experiment also led to a discovery that the scientists had not anticipated. "After settling on the standard model for BACOVO, we observed unexpected properties," says Shintaro Takayoshi, researcher in the Department of Quantum Matter Physics in UNIGE's Faculty of Science. When placed in a magnetic field, BACOVO develops a second set of topological excitations that are in competition with the first, confirming theories from the 1970s and 1980s organised around the field opened up by the work of the Nobel scientists. "As well as proving the existence of this confrontation between two sets of topological excitations within the same material—an unprecedented event—we were able to experimentally control which set would dominate the other," adds Takayoshi. What was originally a theoretical hypothesis became a verified experiment. The in-depth analysis of BACOVO undertaken by the physicists proved that two sets of topological excitations come into direct confrontation in the same material and control the state of matter, which differs according to the dominant set, yielding a quantum phase transition. Furthermore, the scientists succeeded in controlling which set prevails, meaning they could adjust BACOVO's state of matter at will. "These results open up a whole range of possibilities in terms of quantum physics research," concludes Professor Giamarchi. "It's true that we are still at the fundamental level, but it's through this kind of discovery that we are getting closer every day to applications for the quantum properties of materials—and why not quantum computers?"